A new British innovation, the Doddle retractable dog collar is a revolutionary idea that has been featured in the BBC’s Dragons Den. The invention consists of a small pod, 5cm in diameter and weighing less than 1.3 ounces, that is permanently and securely fixed to the Doddle collar. The pod encases a 1m long retractable lead that fully retracts safely into the pod when not being used. The lead is very easy to grab if needed quickly and the looped handle safely springs back into the casing when not in use. After rigorous factory testing, we can fully guarantee that the Doddle retractable dog collar will safely restrain all dogs up to 25kg in weight. Dogs weighing over 25kg that are unlikely to pull and just need gentle restraint can also benefit from the extendable doddle collar. 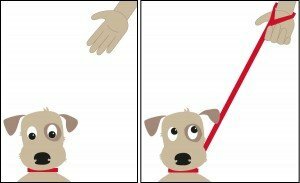 For example, we recently sold 25 dog collars to a UK dog agility training club for gentle restraint for their agility dogs during training. The Doddle can be worn all the time as the dog’s main collar and it can be worn in water if your dog enjoys swimming or paddling! It is fully machine washable and can be cleaned with a damp cloth between washes. There are 3 retractable collar sizes, all fully adjustable to suit your dog’s neck size. 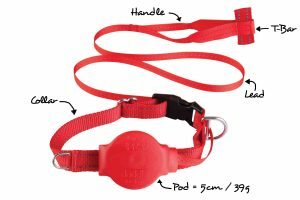 The collars have a “D” ring for attaching identification tags and the pod part of the collar can be engraved if required.